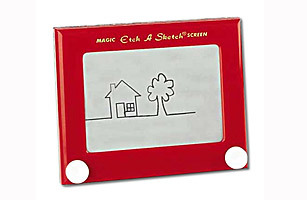 Invented by a French mechanic, Arthur Granjean, the Etch A Sketch, originally called L'Ecran Magique, was introduced in 1959 at the International Toy Fair in Nuremberg, Germany  and it was a total flop. But Granjean eventually found a company to buy it. The Ohio Art Co. invested $25,000 more than it had paid for any previous toy and changed its name to Etch A Sketch; voilà, a hit was born. The magical drawing toy became one of the holiday season's most wanted toys in 1960, forcing Ohio Art's factory into production until noon on Christmas Eve. How it works: Static charges hold a mixture of aluminum powder and tiny plastic beads to the inside of a clear plastic screen. Knobs control the horizontal and vertical rods that move a stylus where the two meet. The point scores a line across the screen's reverse side. Experts can draw curved and diagonal lines. See the 15 smartest toys from the 2011 Toy Fair.